The staff at Rentego were really helpful. Replied to email queries promptly and with good advice. Used their transfers service which again was very good and punctual. 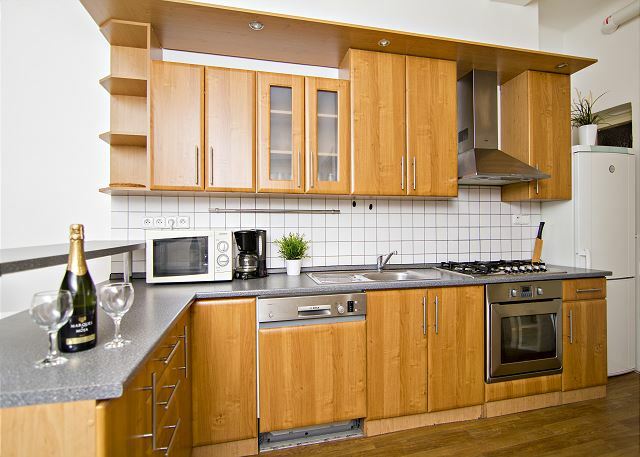 A large spacious apartment in a central location with good transport links nearby. Somewhat noisy over the weekends. Clean and well equipped. We apprecied a large, quiet and very luminous apartment in an a former building. There is a lot of shops near this location, that is very easy. great experience, the apartment in a great location and with many services close, a short walk from the center. 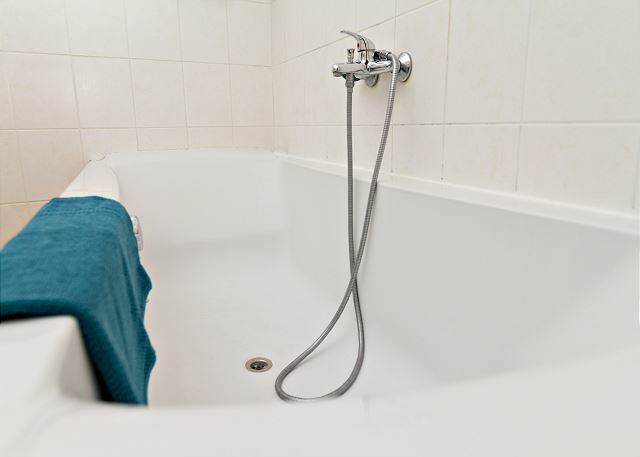 The apartment is large and clean, just not very well maintained but otherwise excellent apartment and staff available. A Great Location but needs to be totally redone. We loved that this was in a non-tourist area yet close enough for an easy walk to Old Town.Wencelas Square is a few minutes away on foot. 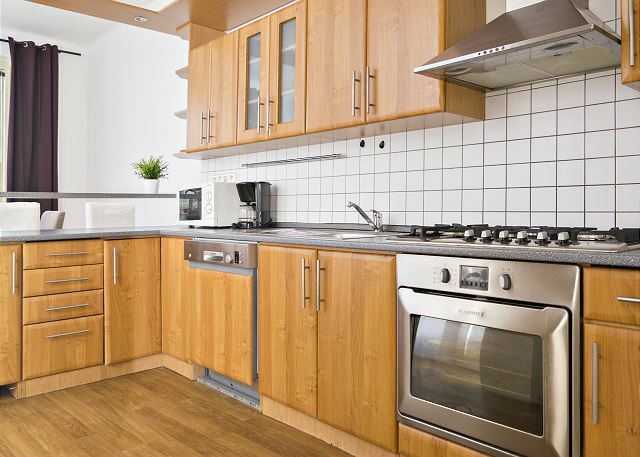 The apartment is also huge which is great.The problem is it's old and has not been redone at all - except the kitchen. The floors are a mess and the furniture is old and worn. The mattresses are very small and soft but we managed to sleep well anyway. We almost left and moved to another apartment but we were convinced to stay due to the location and they were right. The rental company was very nice in working with us. We ended up being comfortable though none of us sat on the couches which were quite dirty. Would we recommend this to anyone. No, not really. It's a shame because it's a large place and a good location but it's just too worn. Very clean but worn. Sorry. 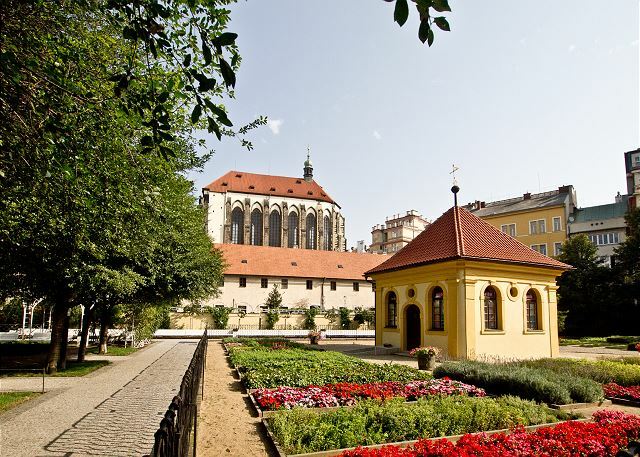 The apartment was within walking distance to Prague's most interesting sites. There was loads of space on the apartment. All the amenities we needed were there including a washing machine. The place was clean . We arranged to have a driver from Rentogo to pick us up from the airport. He was waiting for us when we arrived and we enjoyed a stress free journey to the apartment. Everything was well organized ! Huge apartment in great location! 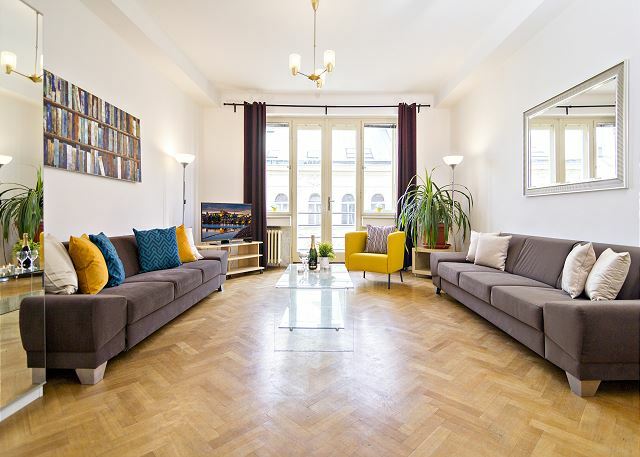 This very spacious apartment is located just a few minutes walk to many of the major attractions of Prague (Old town, Wenceslas square, Charles bridge, the Castle, many museums). It has a good layout, lots of beds, a big nice kitchen and dining area, wash machine, dishwasher - everything you need for your stay. It is a great apartment and I would recommend it. The negatives are that the furniture is a bit worn and stained in places and the beds were a little too soft for our liking. Otherwise, things were in good shape. Nothing to complain about. Well furnished, stayed there with two families. Close to center. Awesome place! Perfect for large family with small kids! Apartment was clean and ready for us! Great location and loved all the amenities apartment had! Mobile internet was a huge help! Comfy beds! Tons of space for whole family! Can't wait to stay with this company again. Customer service was awesome! This plat was perfect for 5 people, with large rooms, 2 bathrooms. Excellent location in the city, we could visit all the city by feet. We'd like to thank the company for the reservation process (keys, code, informations from the airport...) and made this very easy. Everything is OK, Except a little problem;electricity went off just in the morning of the day we are leaving.The answer of how to resolve the problem came too late. Good apartment and location. Good place to visit Prague center. Die Ferienwohnung Kundera war super geräumig, für 8 Personen perfekt! Wir waren positiv überrascht, wie zentral die Wohnung liegt, alles in Fuß-Reichweite. Unser Auto stand die 4 Tage in einem Parkhaus. Die Vermittlung der Wohnung klappte einwandfrei, auch in der Wohnung war alles bestens erklärt. 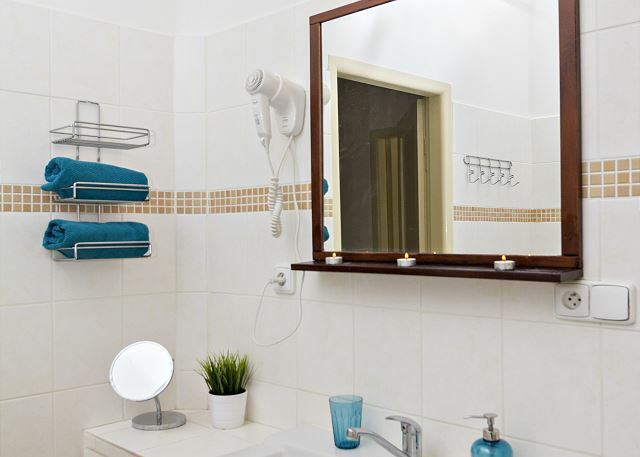 appartamento posto in posizione centrale in zona servita da esercizi pubblici di ogni tipo . Ben accessoriato e pulito ,arredato con gusto. Appartement vaste et bien équipé, très agréable à vivre, conforme à la description. We loved the location of the apartment and the set up. It was clear, spacious and comfortable. However, the elevator broke when we were staying there -- it was 5 flights up and my father had a knee problem, so this was a bit of an issue. We also had two different door codes that did not work the last day. And the lock on the door to the building was very difficult to open. But Alesandra was great -- she made sure we were comfortable with the lock prior to leaving us at the apartment. The place was great, as I said, but I wouldn't feel comfortable staying in the particular apartment again unless I was assured the access to the outside and inside doors had been fixed. Good service to book, key delivery, active communication and late checkout with Rentego was smooth. The best about this apartment was location, also clean and spacious for our 7 persons adult group. Pictures tell well the apartment, though the building also has hostel so the entrance was a bit rough. For adult group looking for weekend leasure time I could recommend this place. the service has been amazing from the RenteGo team. the accomadation really did far better than we would have imagined. 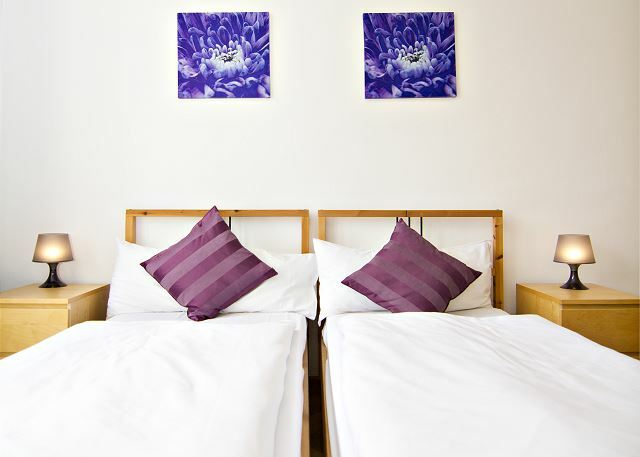 It was very clean, fully functional, comfortable and a great area to stay, with everything in walking distance. The smart TV with Youtube built in was a life saver for some inhouse partying. Thanks Gurvinder, we're glad you enjoyed your stay in the apartment Kundera. Make sure to contact us for your next visit, we would be happy to host you again. Our family of 6 had a wonderful Christmas week in the Kundera rental. It was perfectly appointed and the space was ample to accommodate our family. The location was very convenient and quiet. The staff was fantastic. We would highly recommend. A perfect long week-end in Prague ! 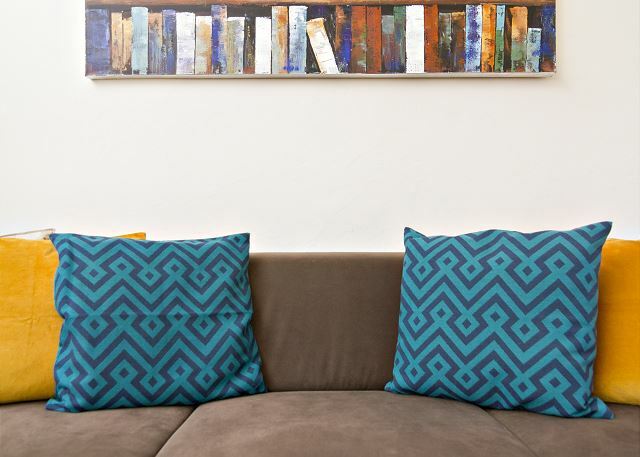 The Kundera appartment is big, pleasant and perfectly located. We visited most of Prague just walking. When going further is necessary, the tramway is just at the corner of the street (we took it once). The minimarkets and the bakery around are really useful. 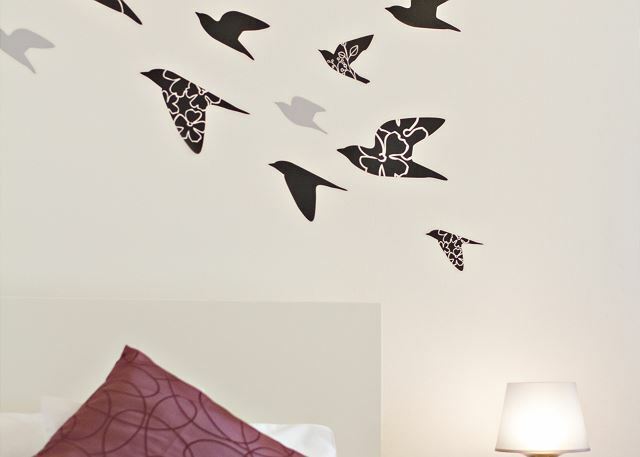 Perfect stay ! We are pleased to hear that you enjoyed your stay so much, Christine! We are looking forward to hosting you again. Nice appartment just in the middle of everything and close to public transport. The location nearby everything does the appartement a little bit noisy. The rooms were nice and big and very clean. The beds were also nice. The kitchen was nice but the chairs very used. We had as usual a very nice stay in one of Rentego's appartment - this was the sixth time we rented at them, and everytime everything was ok. Thank you very much for choosing us again, Kirsten :) We are looking forward to your next visit! 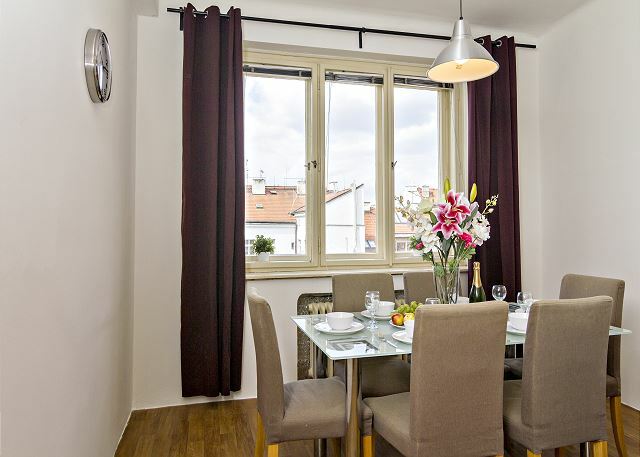 We had a great stay in Prague and this apartment was close to everything. The apartment is a little more worn than the photos show, but overall, not bad for a few nights. It is HUGE! So lots and lots of room. And great views. The kitchen views were nice too and the kitchen and dining area had been updated more recently than the rest of the place. 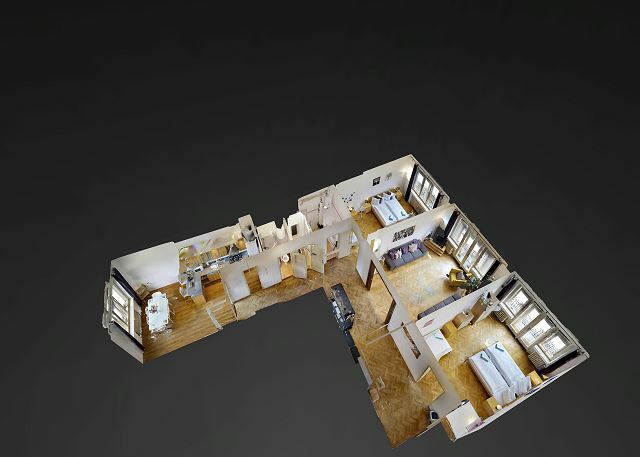 Logement idéalement situé au cœur de Prague. Spatieux Kundera convient très bien à un groupe de 6 à 8 personnes. Nous recommandons! Rentego team was great for the reservation. Tout d'abord: le personnel dont on était en contact lors de la réservation, paiement etc., était tres-tres professionnel, disponible - congratulations et merci!. Leurs effort mérite que l'appartement Kundera soit en meilleur état que nous avons rencontré. La propreté du linge, des serviettes était OK, MAIS les meubles ne sont plus aussi neufs que sur les photos et n'étaient pas tres propres: poussiere un peu partout (le plus génant c'était sur les canapés et sur les chaises: poussiere et chapelure). Je devais faire le ménage pour pouvoir ranger les bagages - pas tres bon commencement pour un séjour. L'appartement est tres bien situé, et bien spacieux. Nous n'avons presque pas utilisé le transport commun. Plusieurs possibilités de restaurants et épiceries tres proche. La solution de parking (Central parking) était aussi satisfaisant. Apartment was above expectations. 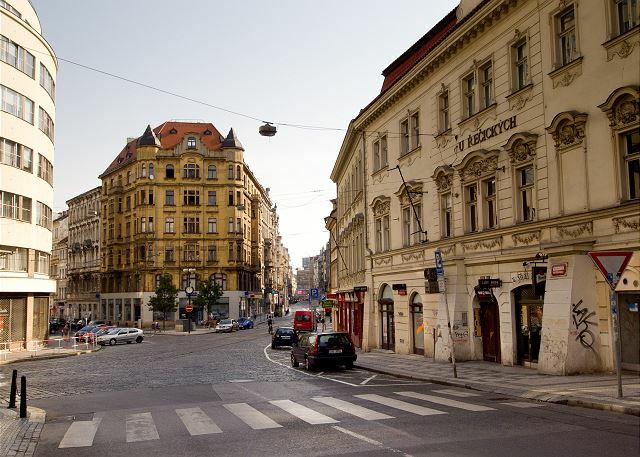 Easy to reach, nice area with an hypermarket near and several restaurants, the old town square was at 10-13 minutes walk. The crew of Rentego is more than great (specially Lenka!). We had a nice time in Prague. The apartment was very spacious and well located. The Service is very good. We had a couple of issues that the rentego team handled responsively. The experience was pretty good. We had a couple of issues that the rentego team, Natali, Ivan and others, handled responsively. 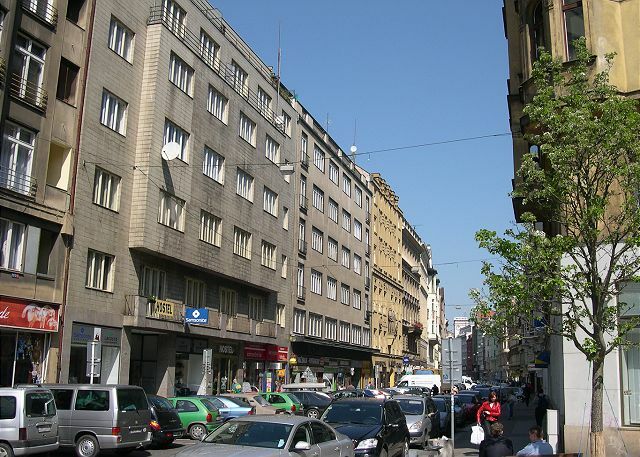 The apartment was very spacious and nicely located near several market squares. Great place! 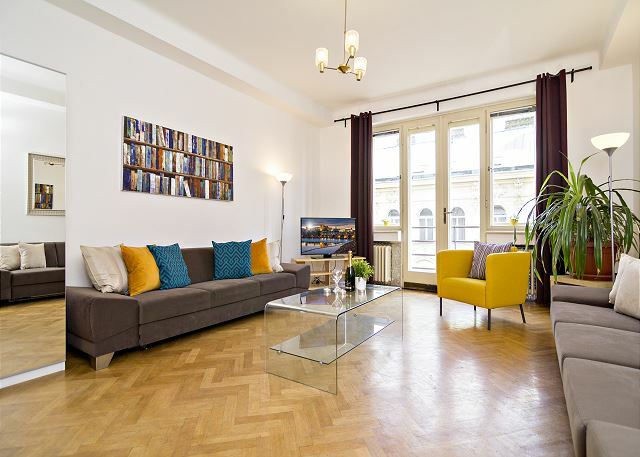 Nice appartement and perfect service ! 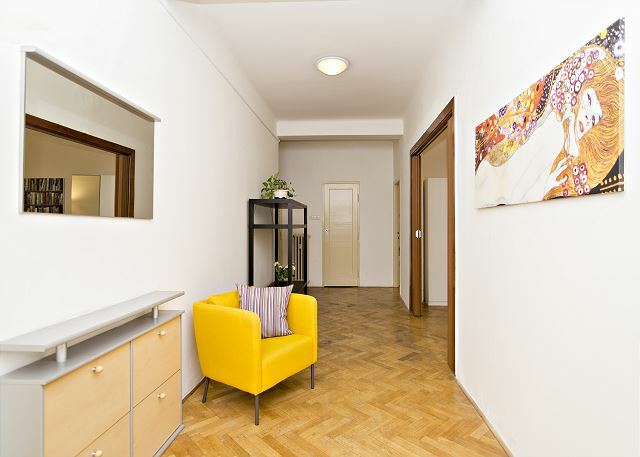 This is a super flat in a quiet section of Prague but only a 5 minute walk to the main square. The customer service was outstanding!! Highly recommended. 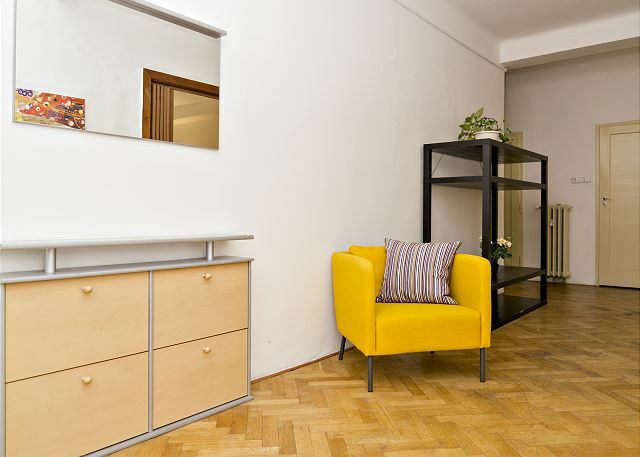 The apartment is spacious, very well located in the Czech capital and the price is affordable to come with friends or family. The apartment is very well equipped. 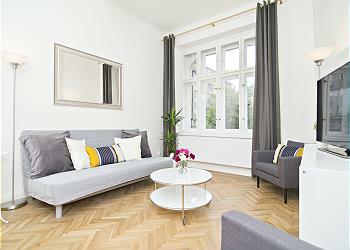 I recommend this apartment and I'll get back to the travel agency for a future visit to Prague. The apartment was spacious with lots of light from big windows. The kitchen was nice and well equipped. We ran out of toilet paper and had to buy our own after the first couple of days. The entrance area downstairs to the elevator was very dark at night. The keys to the street gate and the apartment building didn't fit very well and didn't open the door readily. This was frustrating, especially in the dark. 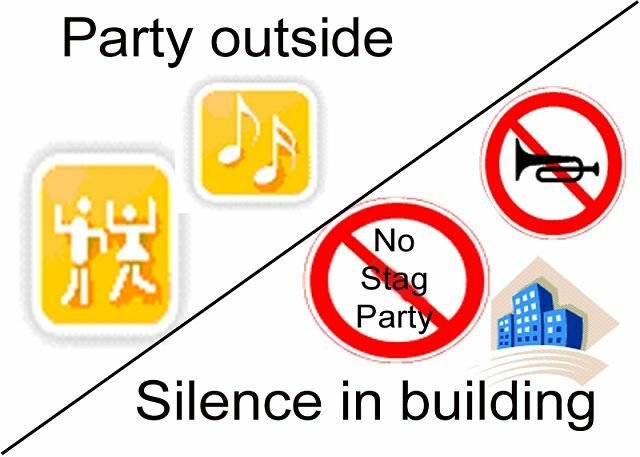 l'immeuble lui-mˆeme est un peu moins bien mais l'appartement, la localisation et l 'organisation : très bien ! 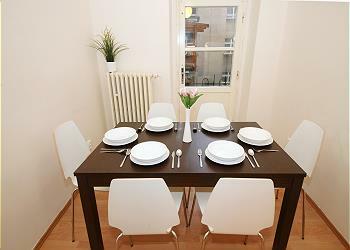 This appartment is very pleasant:spacious, bright, clean and well situated in Praha. 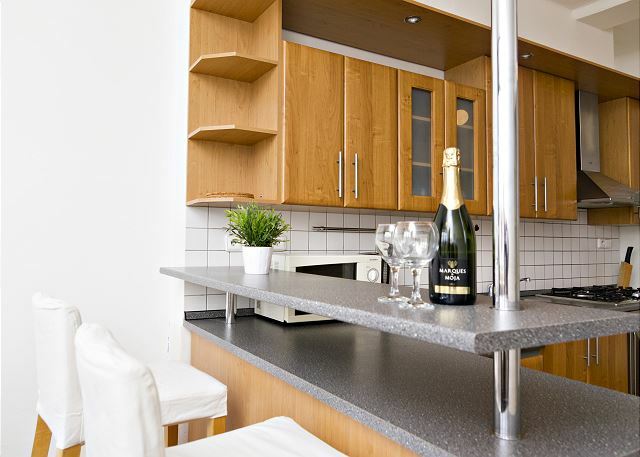 We were a group of 6 ladies and the apartment provided the perfect combination of beds, lounge space and dining and cooking areas. The kitchen was well equiped although the dishwasher was not working but this was not a problem for us. 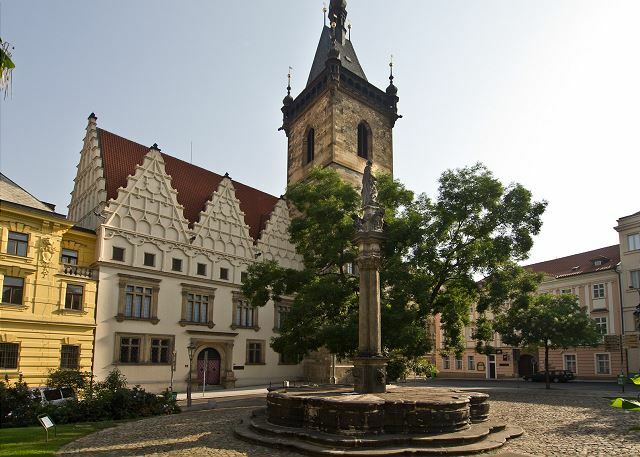 The location was great and only a reasonably short walking distance from the Old Town. In all I would recommend this for a large group. L'appartement est conforme à la description. L'aménagement est très complet et fonctionnel. L'appartement est très bien situé pour tous faire à pied. 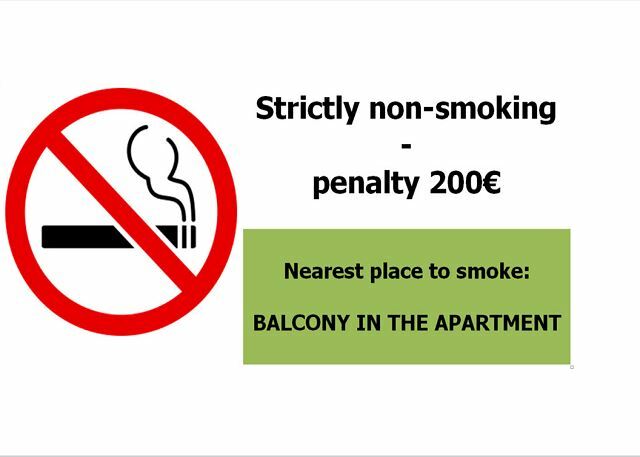 Nous avons passé 5 merveilleux jours à Prague grâce à la localisation et au confort de l'appartement. La location, le bon plan ! Escellente prestation,bon rapport qualité prix. The apartment is massive, clean and has all the ammenities. My only complaint was the general property condition; the lights in the hallways (outside the apartment) didn't work, making it feel unsafe and unkept when we first arrived. Un superbe appartement au centre de Prague, très facile d'accès! Tout a roulé! arrivée à Prague, l'appartement était propre et libre à notre arrivée! nous avons pu déposé nos bagage et partir à la visite de cette belle ville! 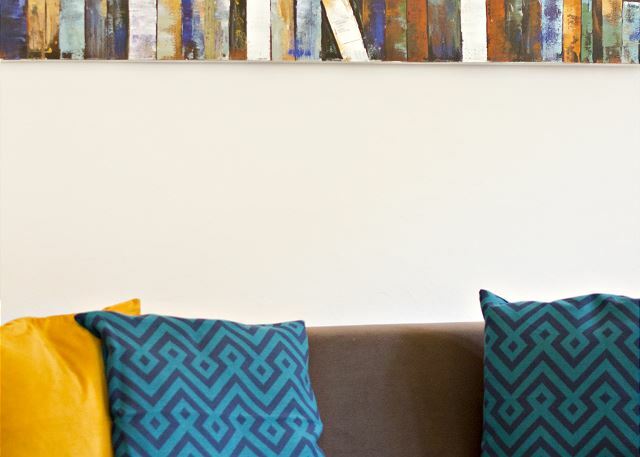 We enjoyed Prague and this apartment a lot! 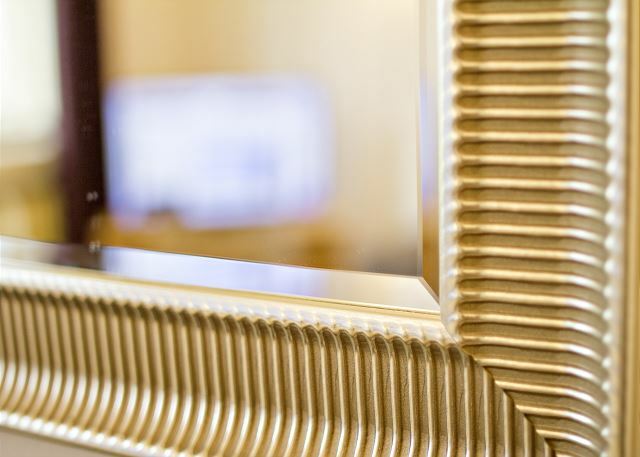 Everything suited to our expectations. Great trip! Séjour très agréable, logement bien situé permettant de visiter l'essentiel à pied. I'd happily stay there again when in Prague with a group. Extremely spacious, many amenities, and the renter was consistently responsive, responding quickly to any and all requests. The apartment was perfect for our stay. Great location and well presented. I would definately recommend you to friends and use your services again. Very large light and airy apartment clean with good kitchen and bathroom,7adults+baby were accommodated fine, two large triple bedrooms and a large living area with sofa bed all with large windows/doors onto balconies, At first sight from outside it is not the poshest looking building, and a little drab in the entrance with small lift up to 5th floor, these are the only negatives which don't really matter,also balcony a bit scary looking down to street(no great views as such). The location is good only 5 or 6 mins from Wenceleslass square and about 12-15 to old town square, the street is quiet with a nice patisserie close by "colore" cafe just along the road and a couple of convenience stores, The busy shopping areas at the end of the street where there are obviously lots of nice places to stop and eat/drink & watch the world go by and go shopping, especially in old town area. Bien sous tous rapports, rien à redire. Apres nous étions six jeune sans un niveau d'éxigance trop élevé. la ville est magnifique et en cette période de l'année l'atmosphère est magique, on retombe en enfance !!! il a fait un peu froid , nous avons même eu la neige mais ce n'était que mieux et encore plus typique ! l'échange avec le personnel de rentego a été également très agréable, ceux sont des personnes sérieuses . Nous avons passé un très agréable séjour. Appartement dans le centre, très spacieux (nous étions 6). Rentego est très professionnel, organisation parfaite , service de qualité. Merci et à bientôt avec Rentego ! trés bien situé. conforme au film. 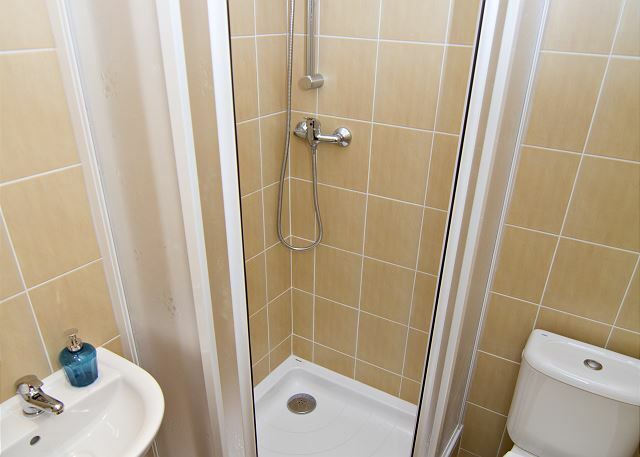 dommage qu'il n y ait qu'une salle de bain quand nous sommes 6 personnes. appartement loué pour 3 chambres alors qu'il a 2 chambres et un séjour que l'on peut transformer en chambre ( mais c'est un lit sur un canapé clic clac) a part ça très bon situation, appartement spacieux, clair, légèrement bruyant le matin avec le camion poubelle qui passe. We really enjoyed our trip in Pragua with friends. 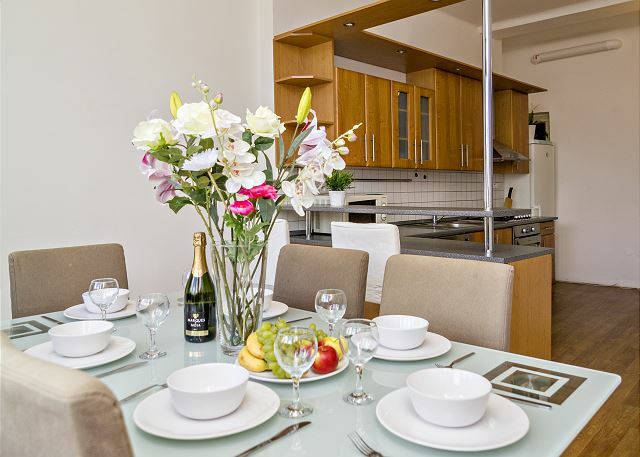 Kendura flat is well located, near the city, with a tram station at 50 metres. 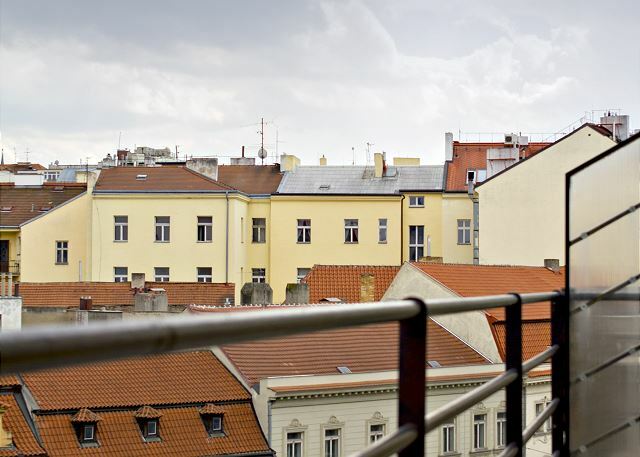 The flat Kundera is very well located, in the downtown of Praha. 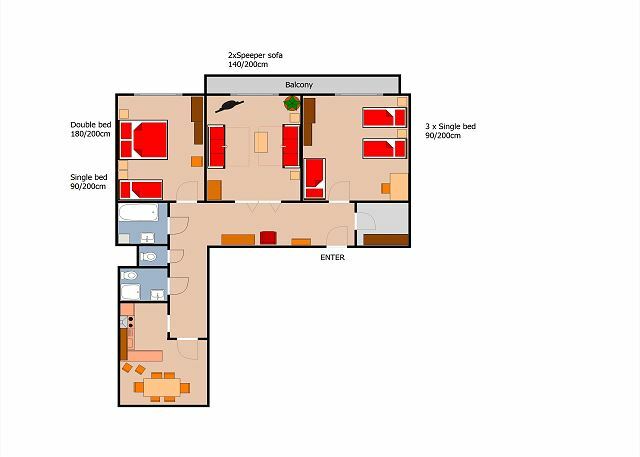 It is very spacious, clean and the best solution for a group of friends or a family. 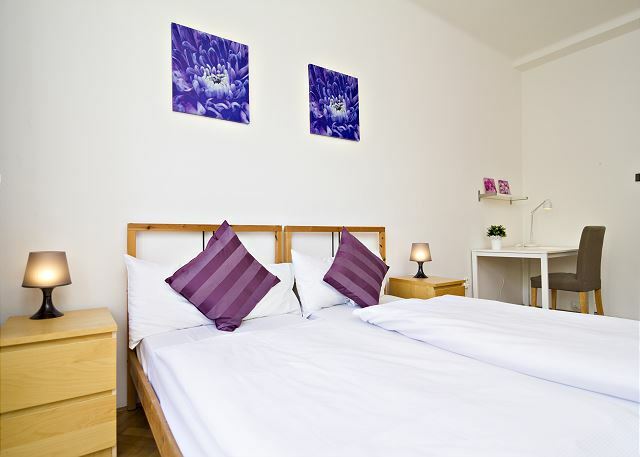 The team of Rentego is very professional, everything is well organised ; I really recommend this solution for a stay in Praha. Makes you wanna stay more. 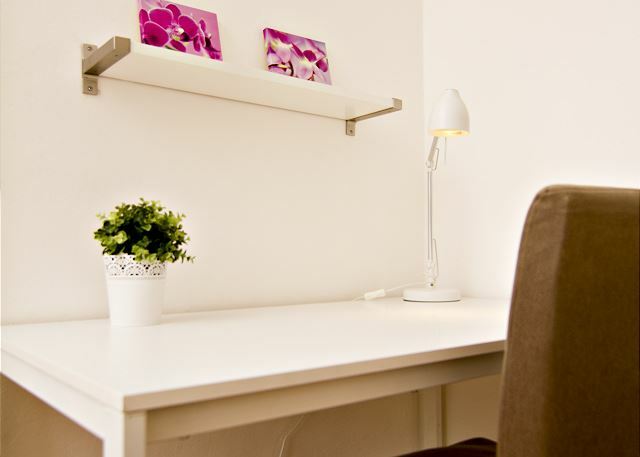 We spent 3 wonderful days in this very wide and fully furnished apartement located right in the middle of the city center. Rentego staff was always available to answer any question we might have about Prag. Really nice and helpful staff. Appartement conforme au descriptif, bien situé, proche métro et bus, spacieux, lumineux. 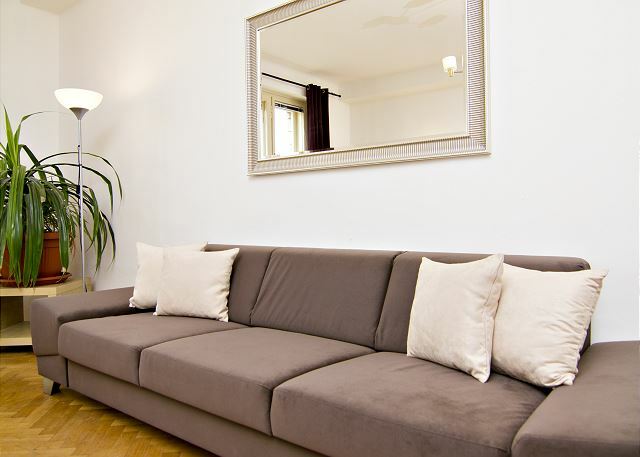 The location is perfect, the apartment very clean and well equipped and the company is very professional and dedicated! I strongly recommend rentego! Quartier agréable et très proche des principaus sites touristiques, en particulier de la vieille ville. Toutes commodités à proximité (commerces, restaus, etc). Proximité également du métro et des trams. De plus agence très disponible et réactive en cas de difficulté. Un petit point à améliorer: le stockage des bagages à l'arrivée et au départ si l'appartement est occupé: la consigne de la gare c'est pas top! 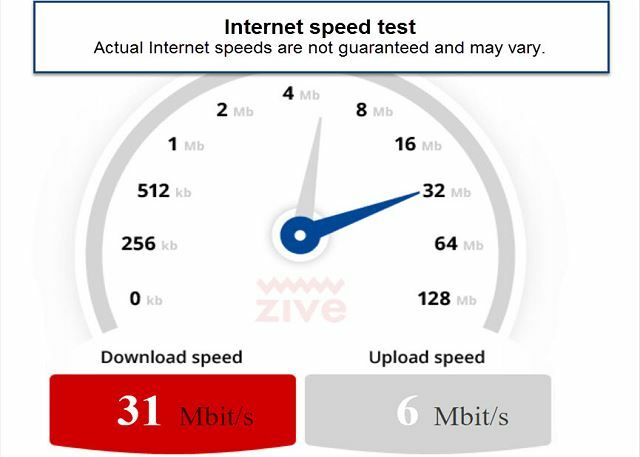 Mais au final appartement calme, spacieux avec Wifi, pas loin d'être parfait. Nous conseillons vivement. It was great,but the entrance hall was very dark! on the video and perfect for group of people. 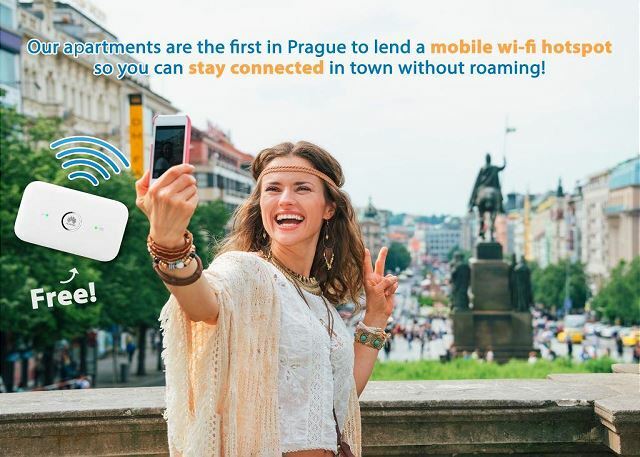 I highly recommand this flat and rentego in general and will definitely use this service next time I go to Prague. This was a very easy and pleasant process to book (we are a University group working through the school purchasing process and the RENTeGO team was more than helpful in making payment arrangements) and a great location for our stay. 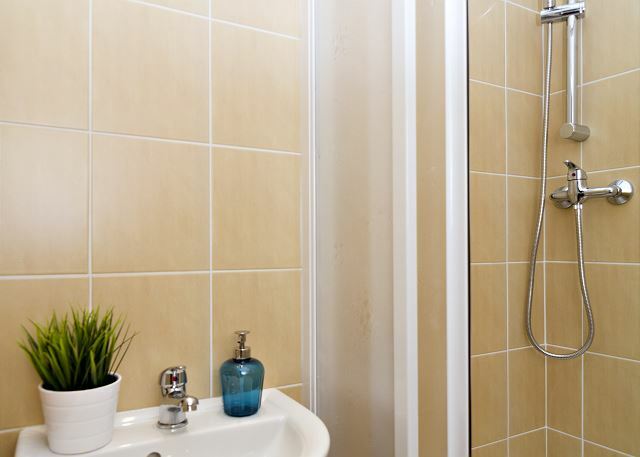 It was a perfect solution for a group of six people and there were amenities and necessities nearby- close to three major transit stations and shopping. Très bel appartement, très bien situé !